Pictures: Please browse the selection here. Click here to see the list of pictures for this track. 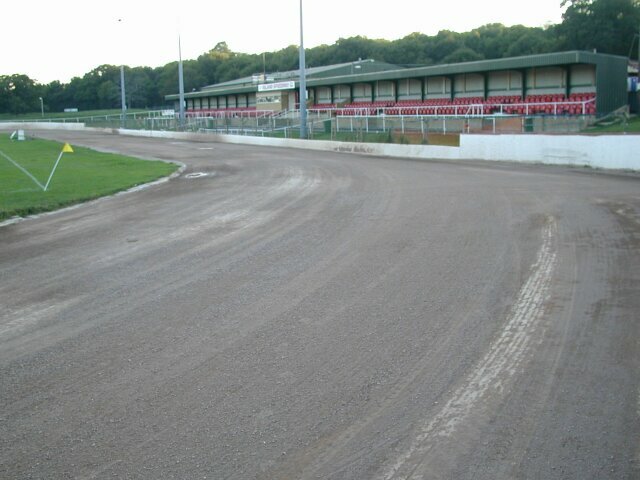 The track opened on 25th Apr 1971 and hosted the Isle of Wight champs in the 1970s. However there is also reference in AW to the opening of Ryde Athletic Stadium which was the track's former name on 12th Aug 1973 by Marea Hartman. It stopped being used for athletics around 1993 when the synthetic track at Sandown opened and was largely disused until 1996 when it was converted into a speedway track which is now 382m in length and home of the Isle of Wight 'Islanders'. The infield is a football pitch used by Ryde Sports FC. The only evidence of athletics at the stadium now is a DT circle inside the first bend. There is a covered stand down the length of what was the home straight which predates the end of the use of the track for athletics.